In this section, we will solve an ANSYS Fluent job in batch. 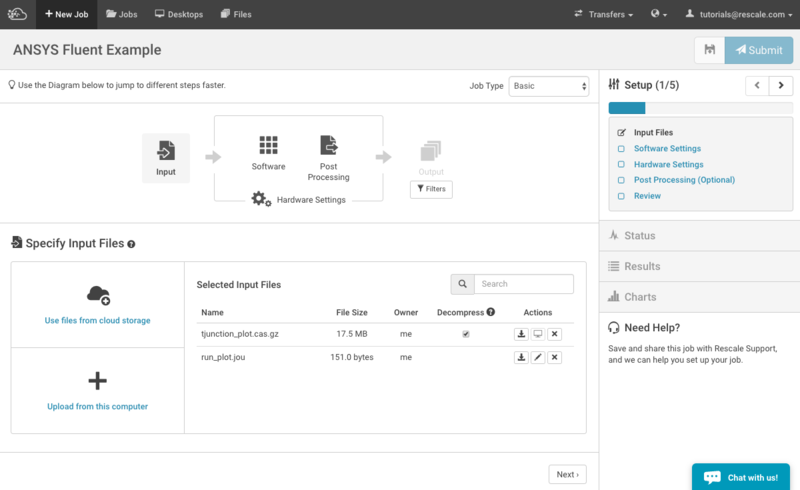 To obtain the files needed to follow this tutorial, click on the "Job Setup" link below and clone the job hosting the file. 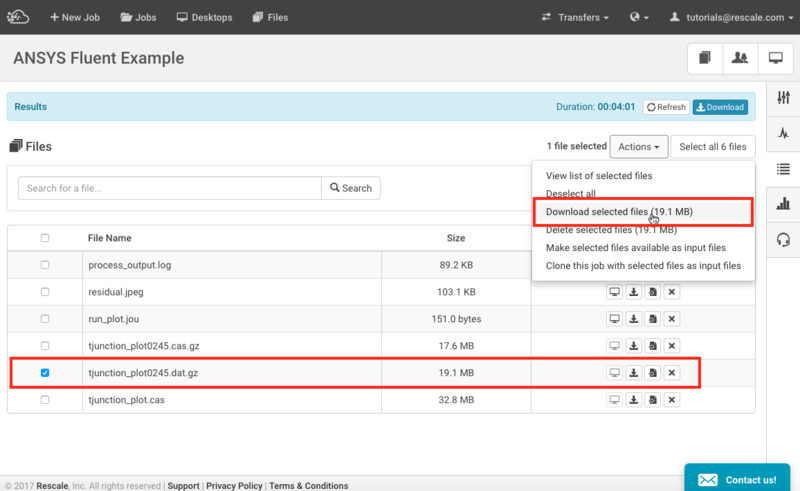 Next, click "Save" on the job to have a copy of the files in your Rescale cloud files. Name the file with a .cas or .cas.gz extension and select the location where this file will be exported to. This file contains all pre-processing settings, and solver and physics setup that have been configured in the GUI, as per your standard workflow. On a Windows Explorer window, right mouse click > New > Text Document (or similar for other OS). Give the file a name, with extension .jou. Accept the change to file extension. Double-click the file to open it and enter the journal commands, then save the file. The journal file shown above reads the case file, sets the batch options, initializes, runs the calculation for 500 iterations, and finally writes a case and a data file when the solution has converged to a prescribed limit. 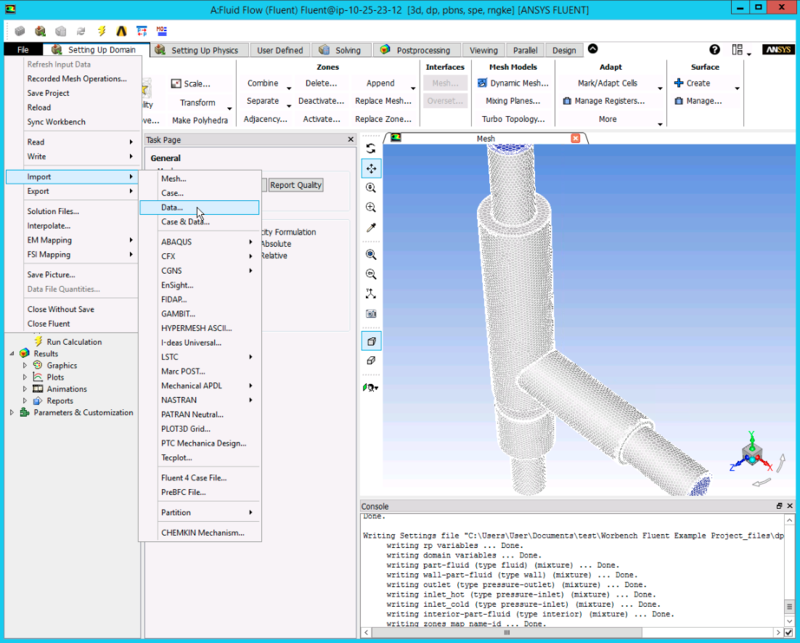 This file is written using the ANSYS FLuent Text User Interface (TUI). For more information about using specific text interface commands, please refer to ANSYS Online Documentation here. Go onto the Rescale plaftorm, click on + New Job on the top left. Name your job and make sure the Job Type is set to Basic. Next upload the journal and case files as input files. Click Next to move onto the Software Settings section of the setup. 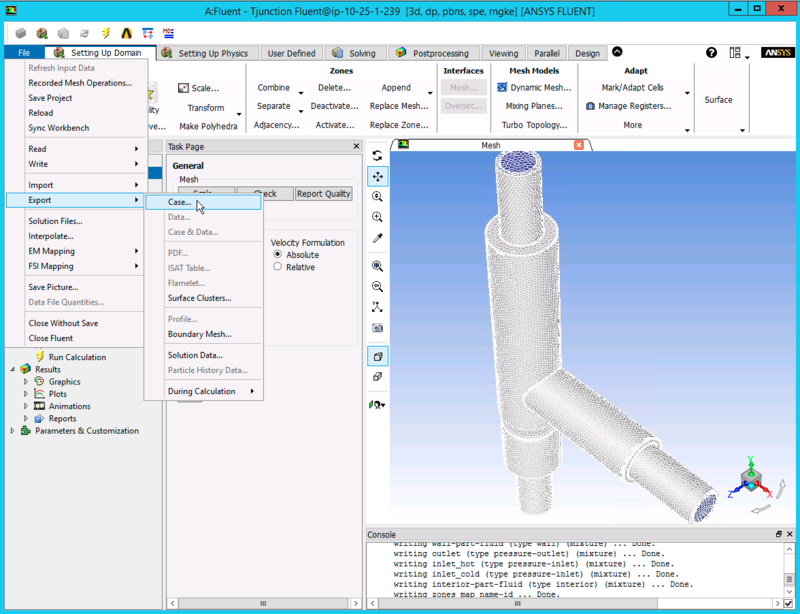 You can scroll down or use the search bar to select ANSYS Fluent. 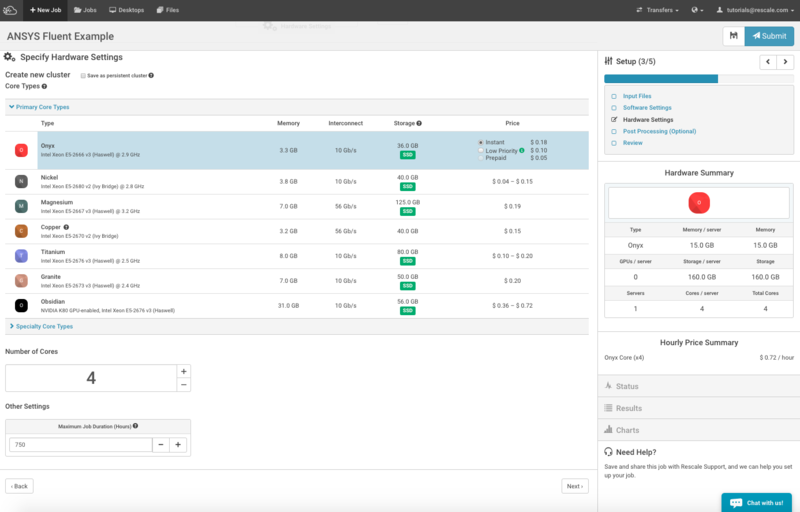 The Analysis Options will display and select version 18.0. In the command window, you will need to specify the journal file name under the angle bracket <journal filnename>. We would also like to see the solution residual. To do this, we command to keep the graphics windows using the -gu option. Next under Licensing Options, select Use Existing License and enter your ANSYS server connection port numbers under License and ANSYS License Interconnect respectively. 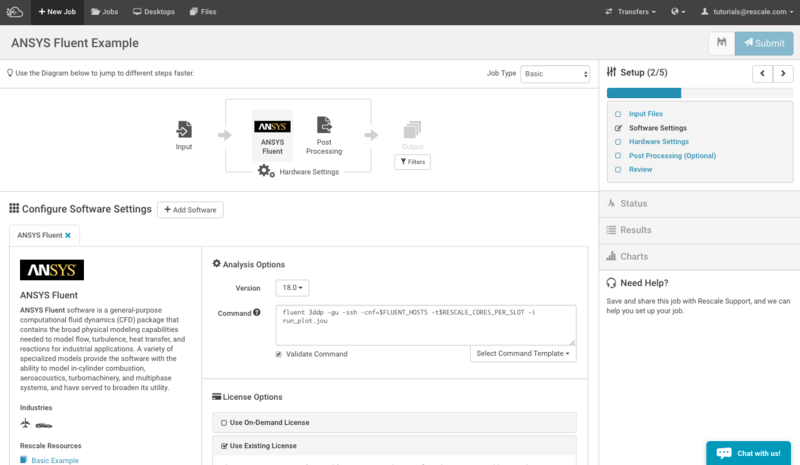 For this tutorial, the software settings page will look as shown below. The next step is to select the desired hardware for the job. Click on the Hardware Settings icon. Select your desired core type and the numbers of cores that you want to use for this job. For this tutorial, select Onyx and 4 cores. Once you have reviewed your setup, you are ready to submit your job. Click Submit and you will move on from the Setup page to the Status page in the Rescale platform. Here, you will be able to monitor the job progress in a gantt chart like format, see a date and time stamped log and live-tail the status and output of your job using the Live-tail window. A guide on "Monitoring Status" on Rescale is found here. 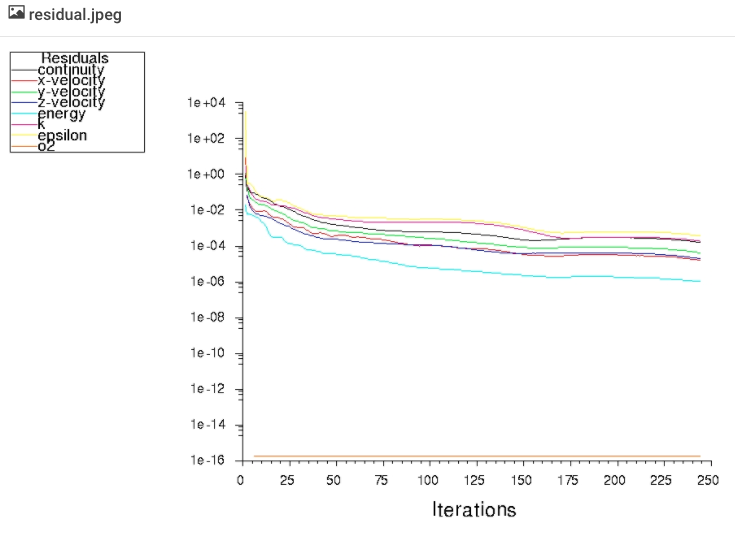 In this example, we have configured the simulation to output a residual plot at every iteration, which will show up under the Live Tailing window as a residual.jpeg file. You can open this graph at any time to monitor the progress of the solution&apos;s convergence. At this point, you can proceed to your post-processing activities as you would normally do after solving an Ansys Fluent simulation interactively. ANSYS Fluent also has the capability of allowing users to modify or extend the behavior of the physics and solver setup. User defined functions (UDF) can be used to perform actions such as impose boundary conditions, physical and chemical processes, heat transfer and phase changes. In this section we present instructions using Fluent User Defined Functions (UDF) in batch mode on the Rescale platform. This guide will assume that you already have developed a UDF ready for compilation in a Fluent job. For assistance on creating or debugging UDFs please contact ANSYS Support directly. 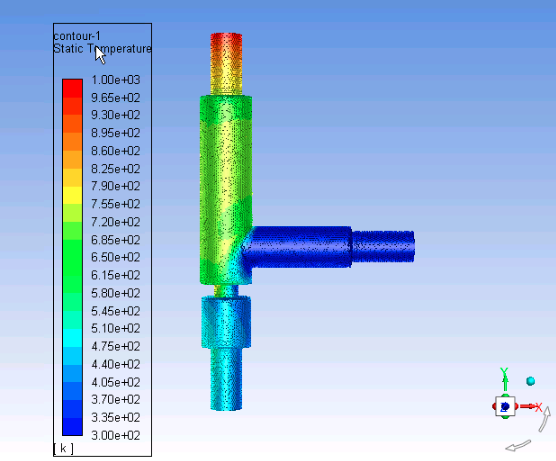 Here is a guide by ANSYS on using UDFs in Fluent. To utilize a UDF during a batch run, the UDF source code must first be compiled and accessible by Fluent. We will demonstrate a workflow that compiles the UDF at runtime before the main solution solve or iteration process. 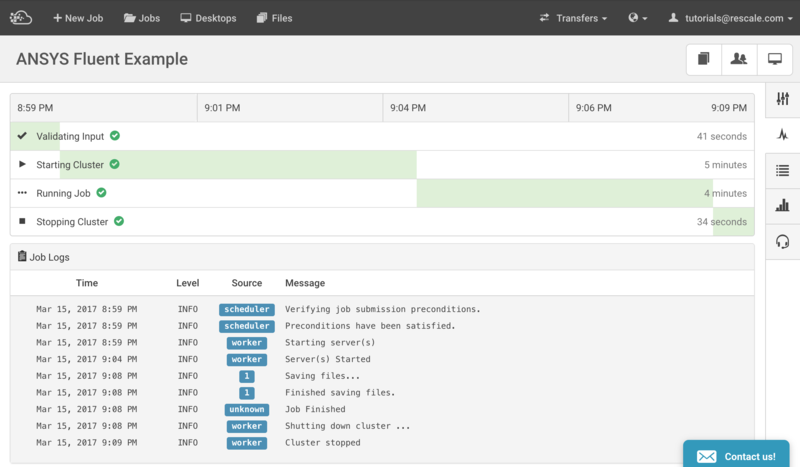 We will accomplish this by adding commands to an existing example journal file. Depending on your workflow and the size of the compilation libraries, it is possible to have these UDF libraries pre-compiled and included as input files to your batch job. But generally UDFs are straightforward codes, so runtime compilation is a short opertation and avoids any platform inconsistencies. The following is an example of a journal file that compiles a user-created custom_UDF.c file in current directory (with the journal file) and loads the resulting UDF libraries. The UDF is compiled with the default library name libudf and creates a correspondingly named directory structure with the shared libraries. Here, the compilation and load commands (shown in bold) are sequential and take place before the solution initilization. 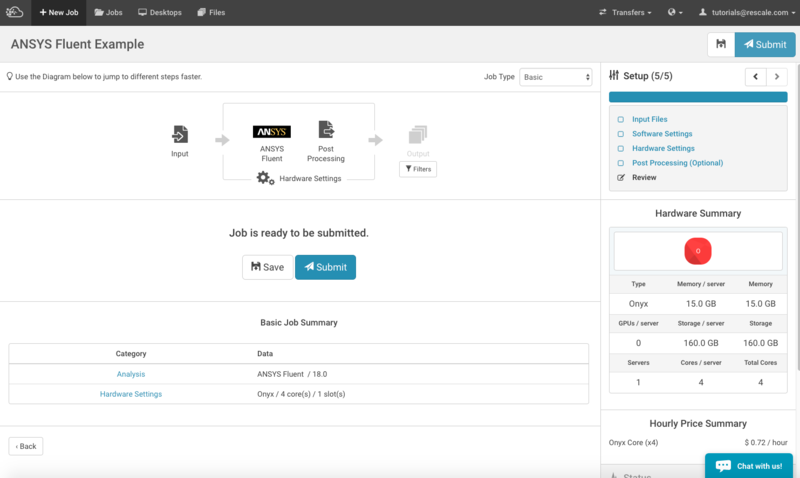 But you can perform these operations anywhere they fit into your workflow. /define/user-defined/compiled-functions compile libudf yes custom_UDF.c ""
There are two specific syntax things to note here. The first, is that after the UDF source code file name, there are two double quotes "" present. The second is the blank line after the compile command. This ensures that the compile function does not attempt to treat following lines as additional file names to include in the compile. The blank line is necessary after the compilation command but does not need to precede or follow the load command. So again, if you are running on multiple cores on a single node, this step is unnecessary since the local file system can be accessed by all the cores on that node.